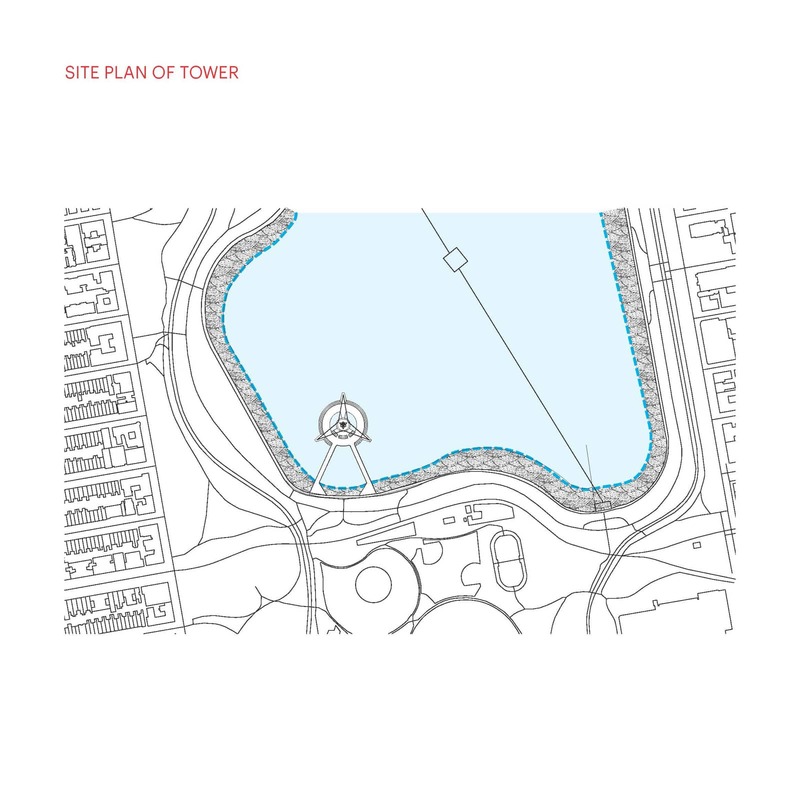 In response to growing demand for public bird’s eye views in the world’s tallest cities and an increasing need for innovative environmental cleanup strategies, DFA’s design for the Central Park Observation Tower—the world’s tallest timber structure—transforms the Jacqueline Kennedy Onassis Reservoir into a non-toxic, people and habitat-friendly pond in the heart of New York City’s largest park. 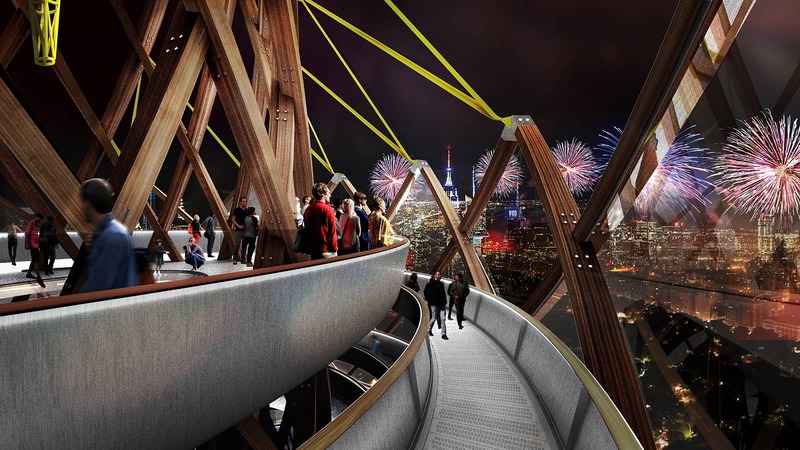 With the public’s best interest in mind, it is both a recreational amenity and a productive infrastructural investment. 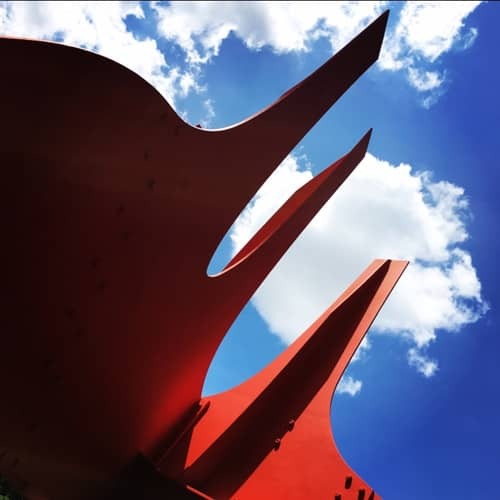 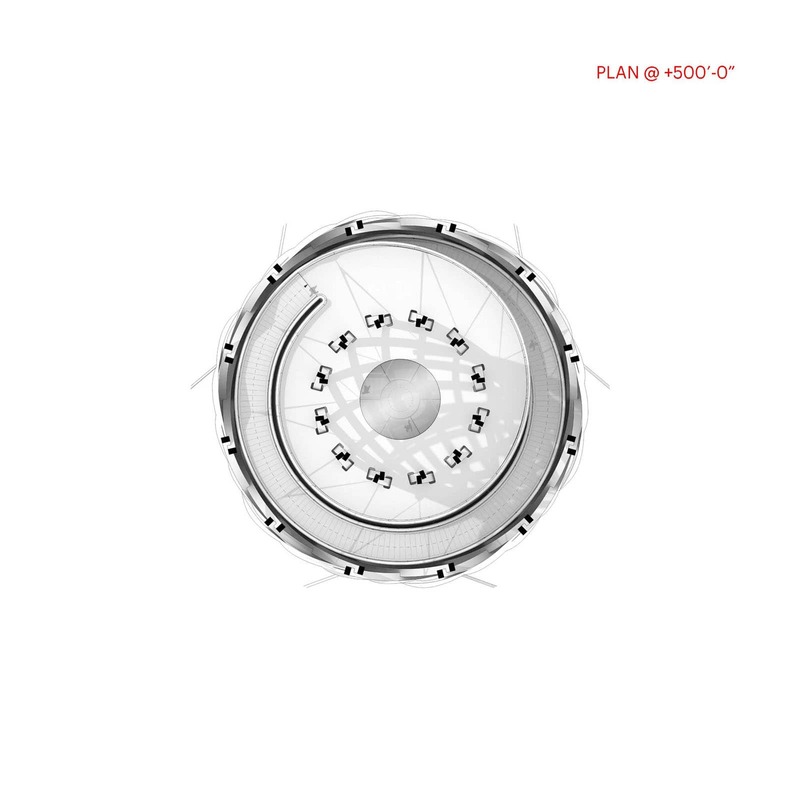 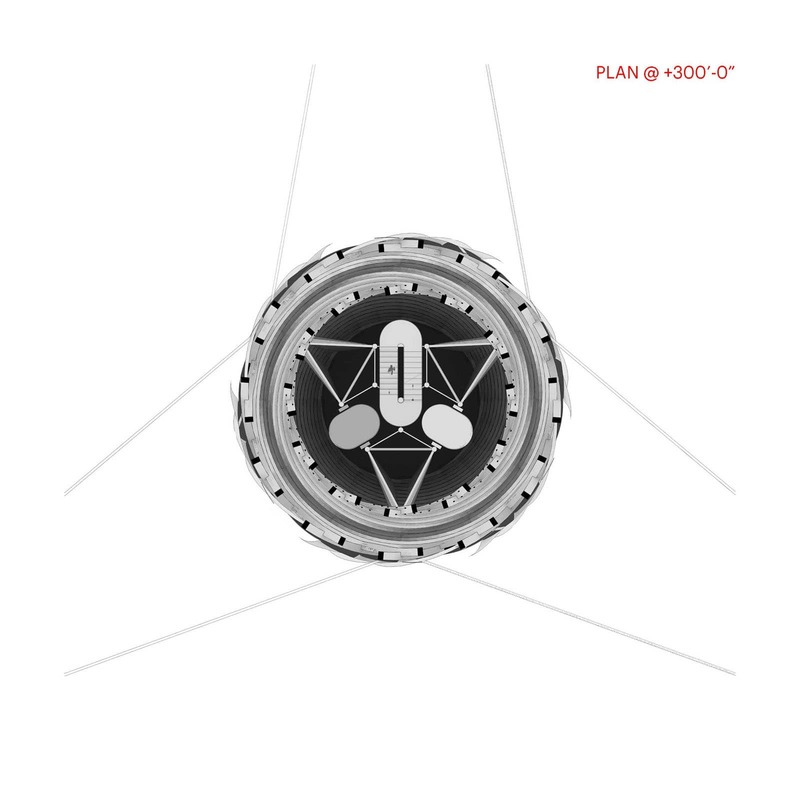 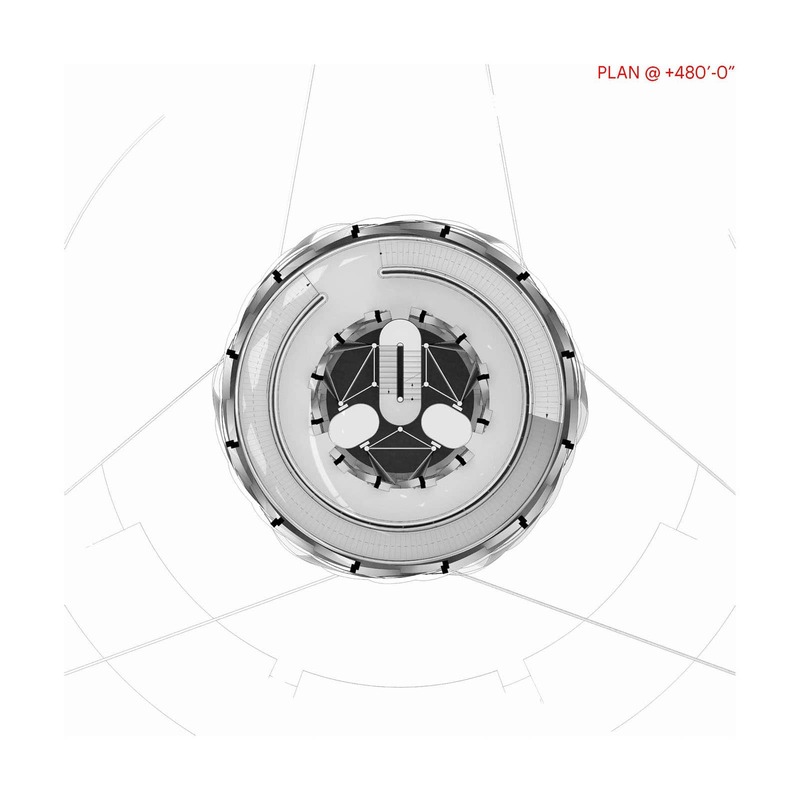 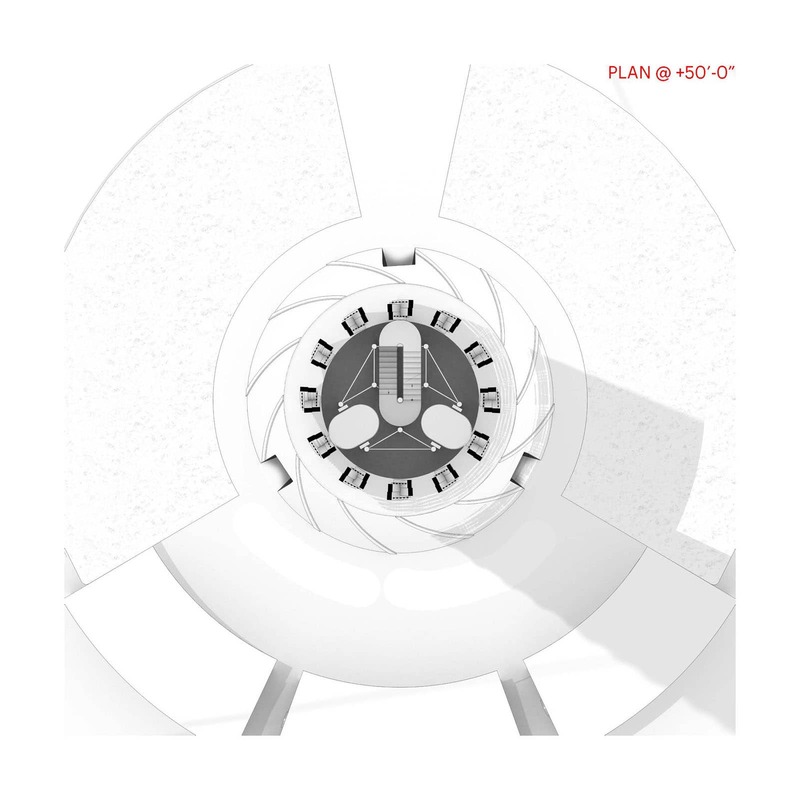 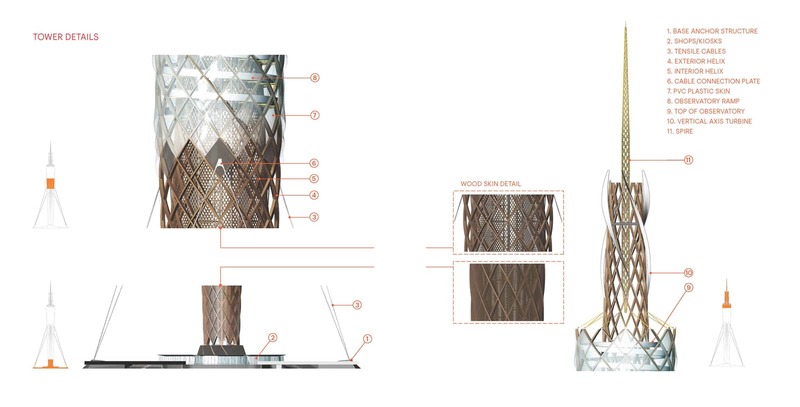 The CPOT is anchored to a base structure of pre-cast concrete elements and stabilized by tensile cables. 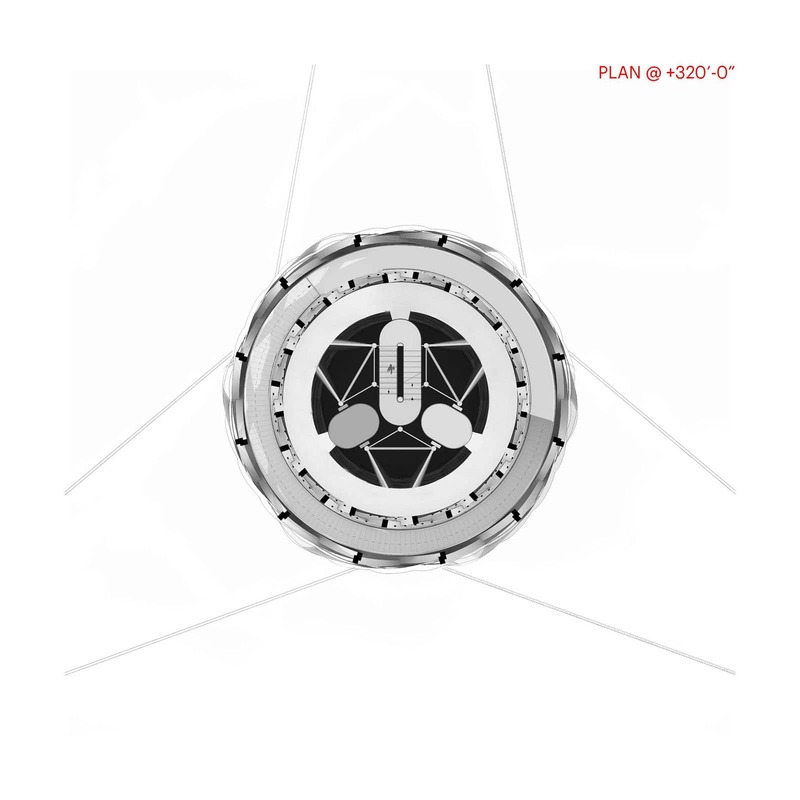 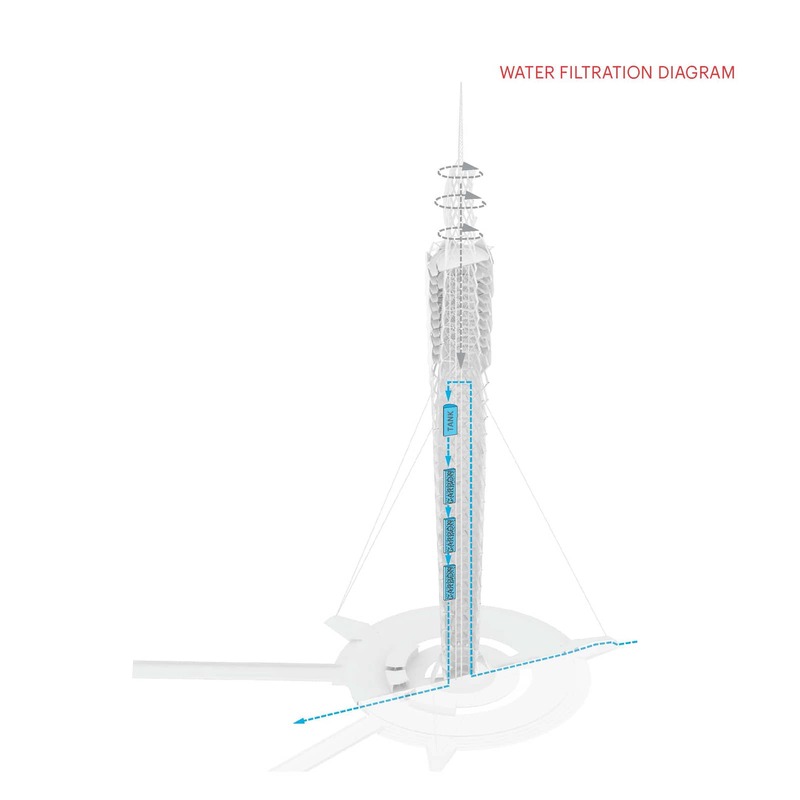 Its first element houses a steel core and a water filtration system. 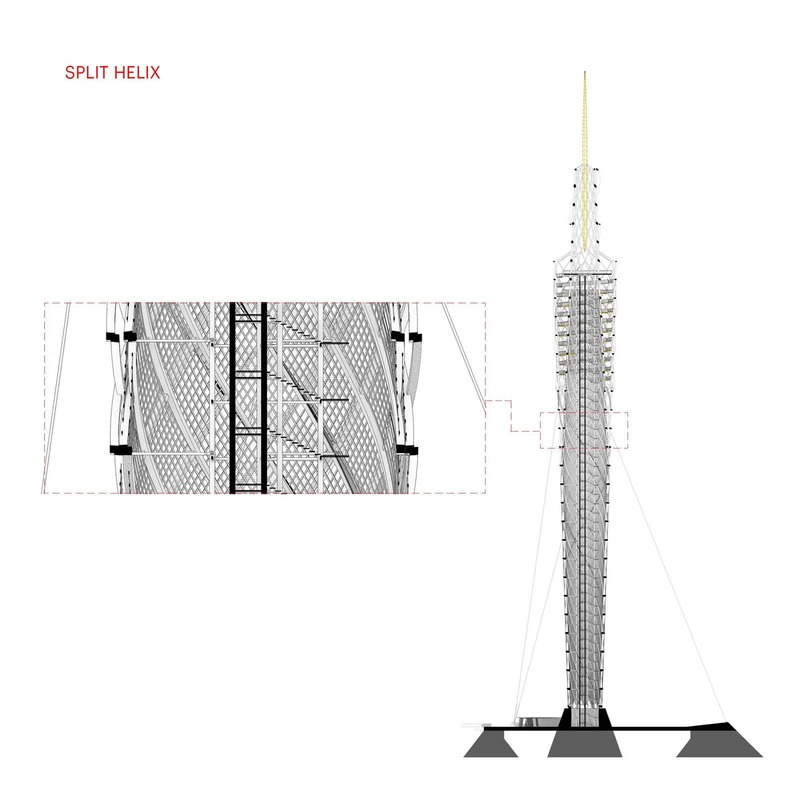 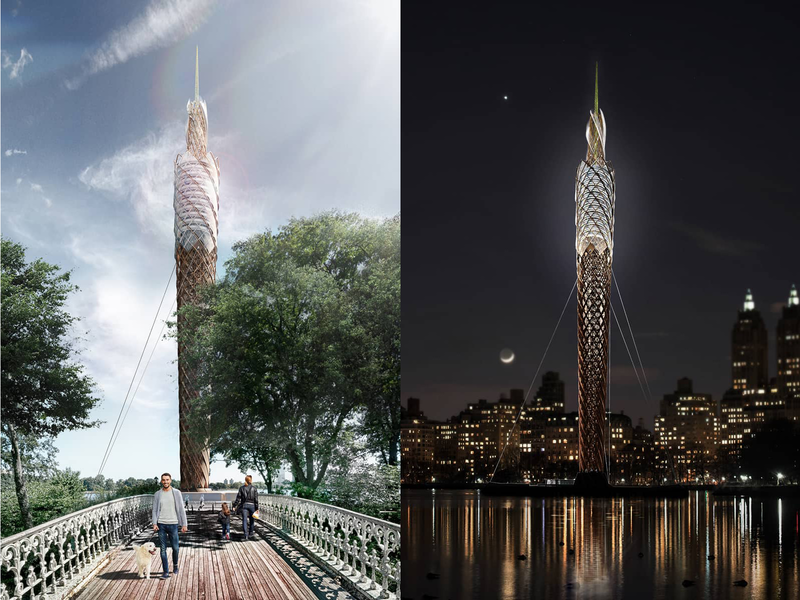 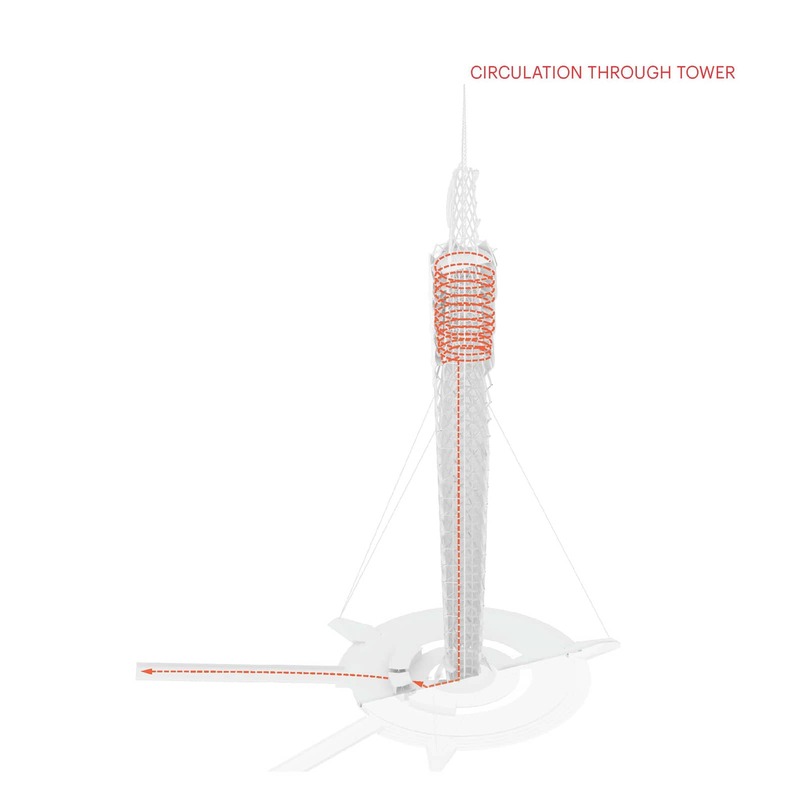 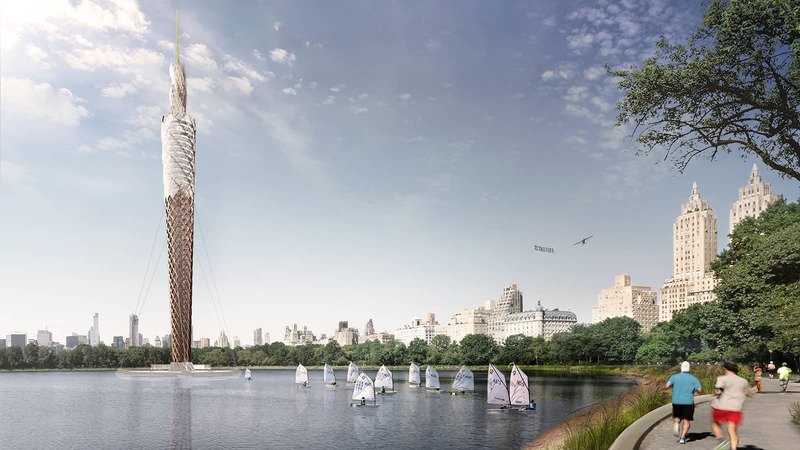 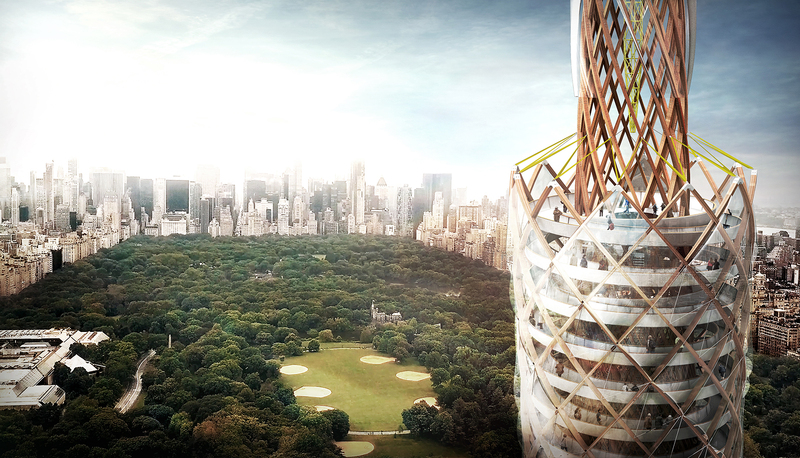 From 475 feet to 600-feet the densely configured jointed interlocking woven wood helix rises to form the primary tower. 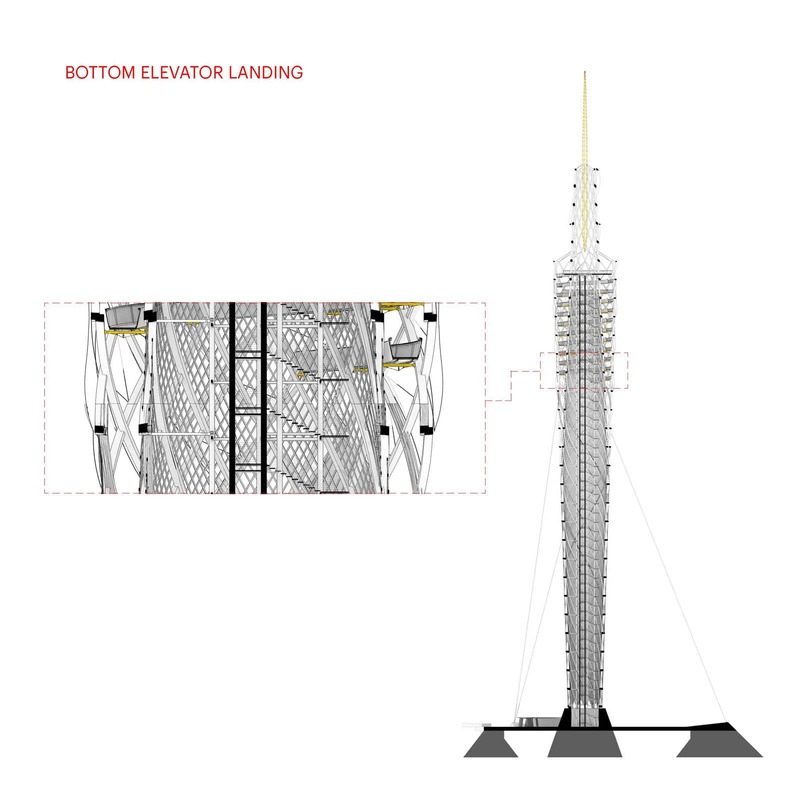 A steel ramp equidistant to a New York City perimeter block wraps the interior core from the 375-foot to 500-foot mark of the tower. 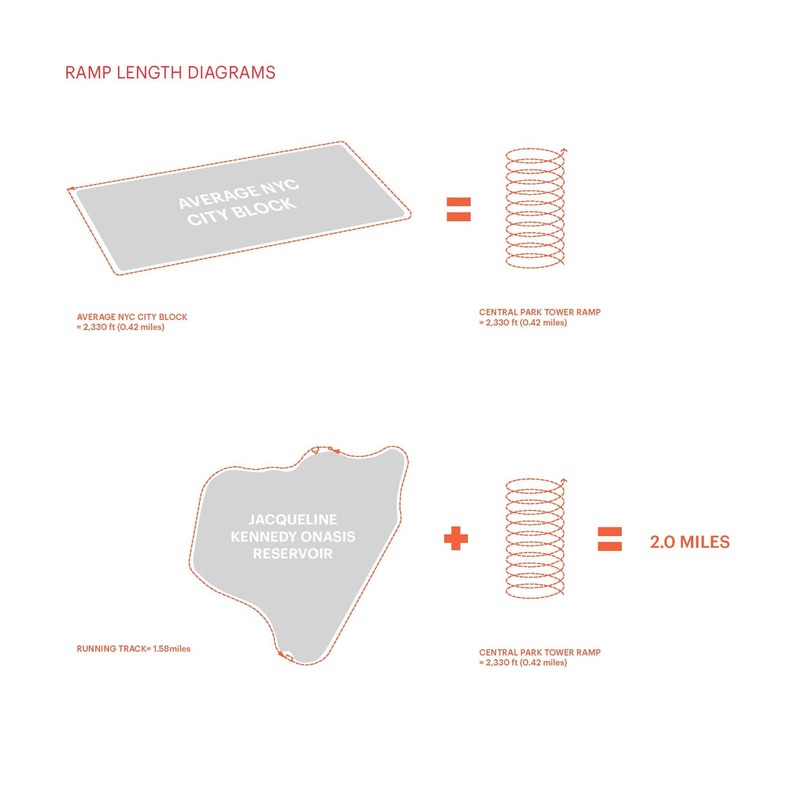 Encapsulating the ramp is a more open, expanded exterior wood helix and skin that rises 500-feet into the air as a single gesture. 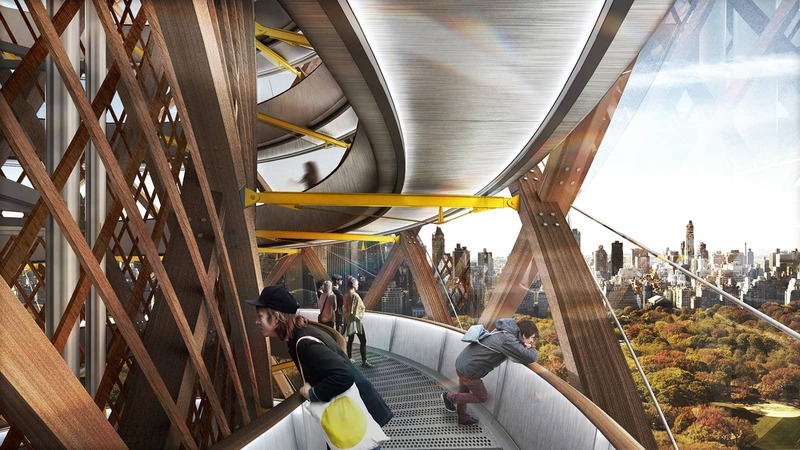 The porosity of the exoskeleton opens up visibility of the ramp and people from the ground as well as to the city, rivers and park from above. 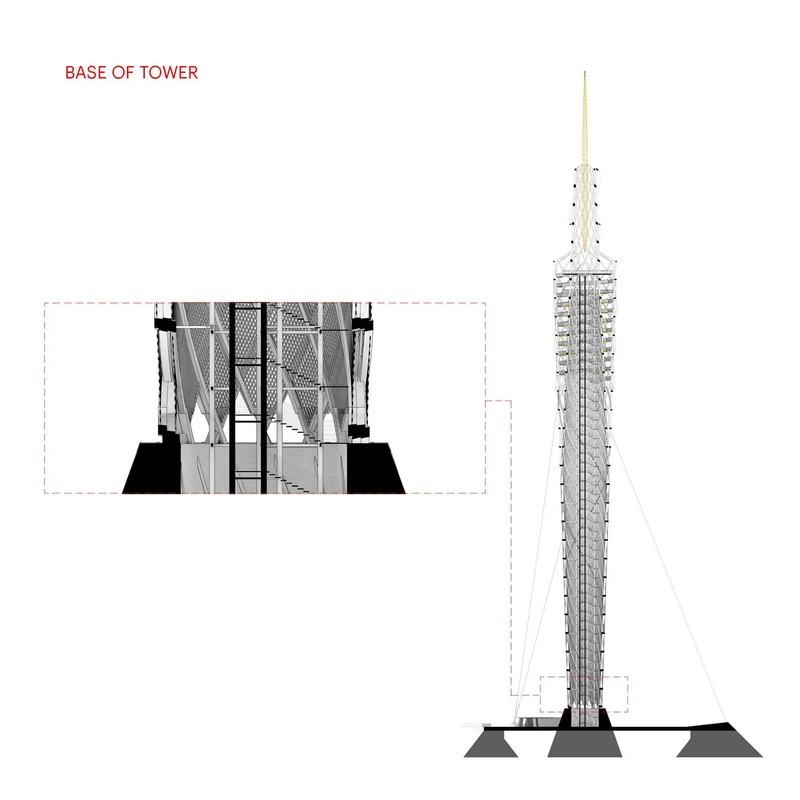 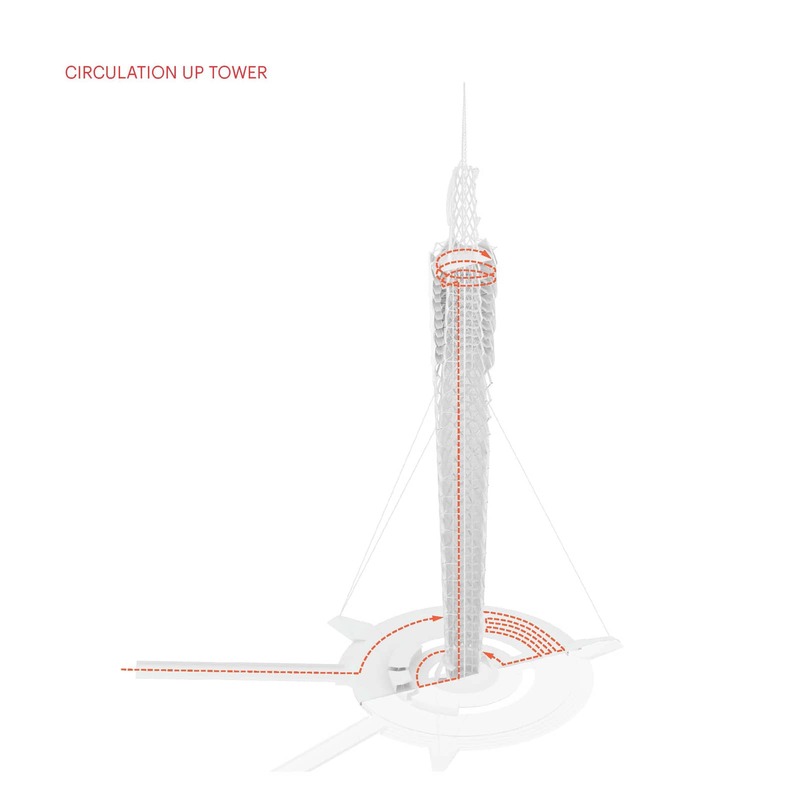 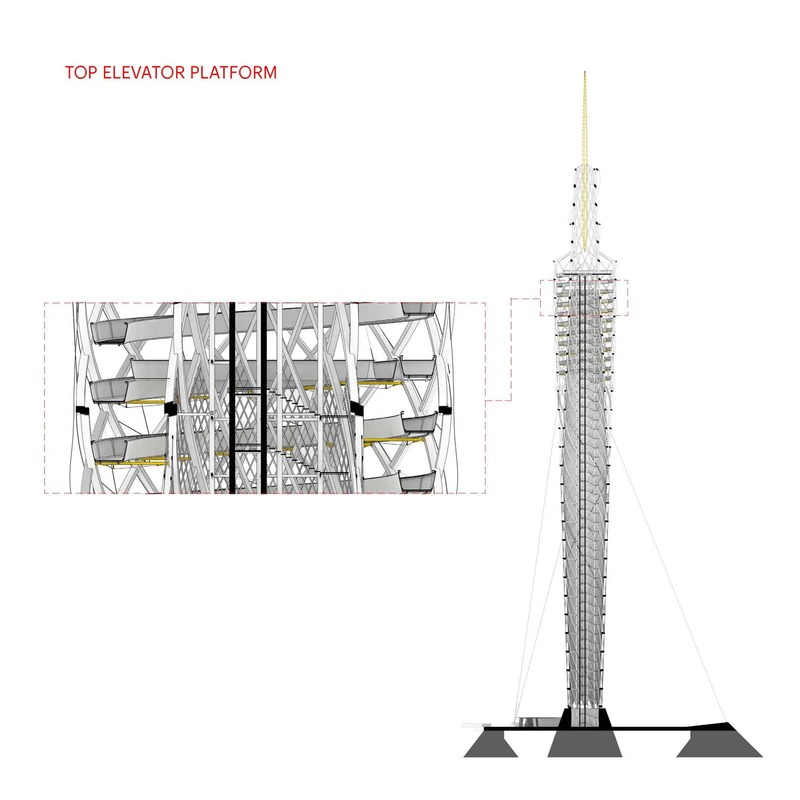 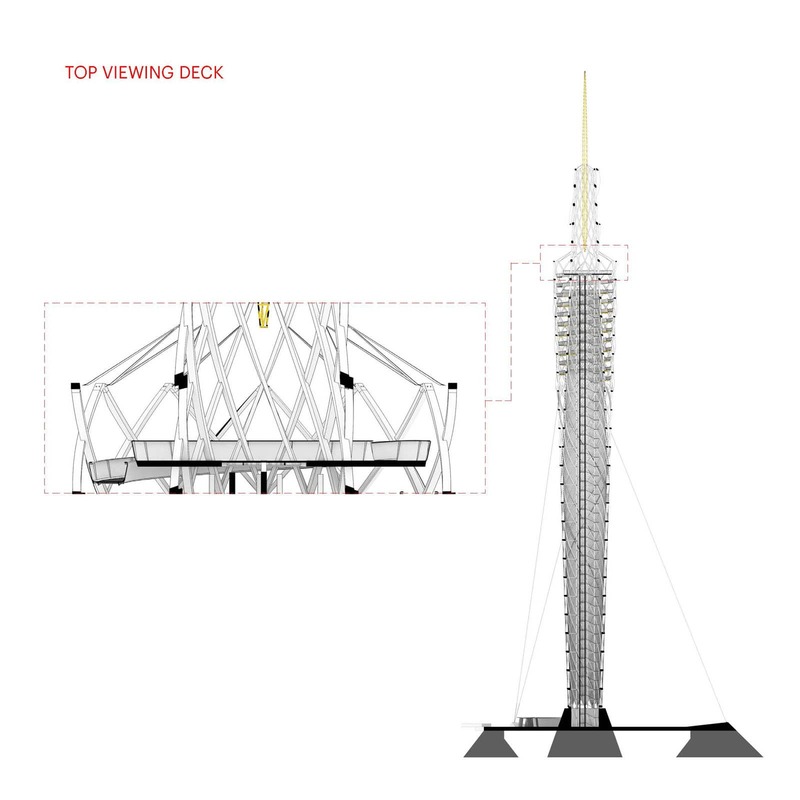 The main attractions are a 56-foot wide viewing platform that gives 360-degree panoramic views and a glass oculus that showcases the functional elements of the tower. 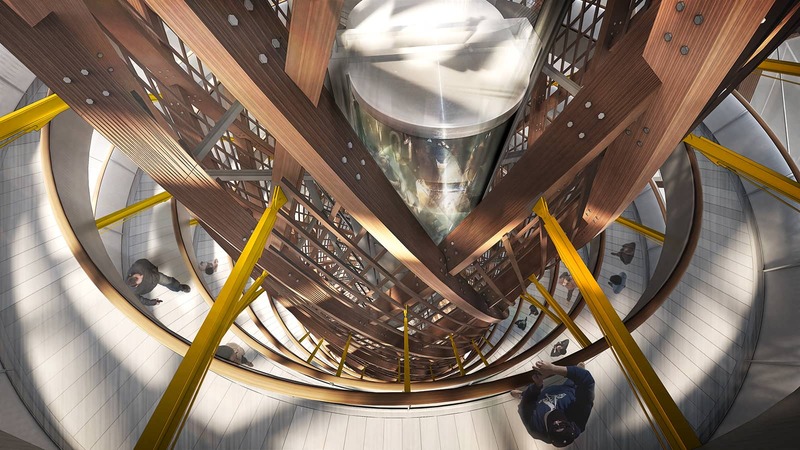 Rising above the ramp and visitor realm is a wind turbine circling around the top 100-feet of the interior wood helix. 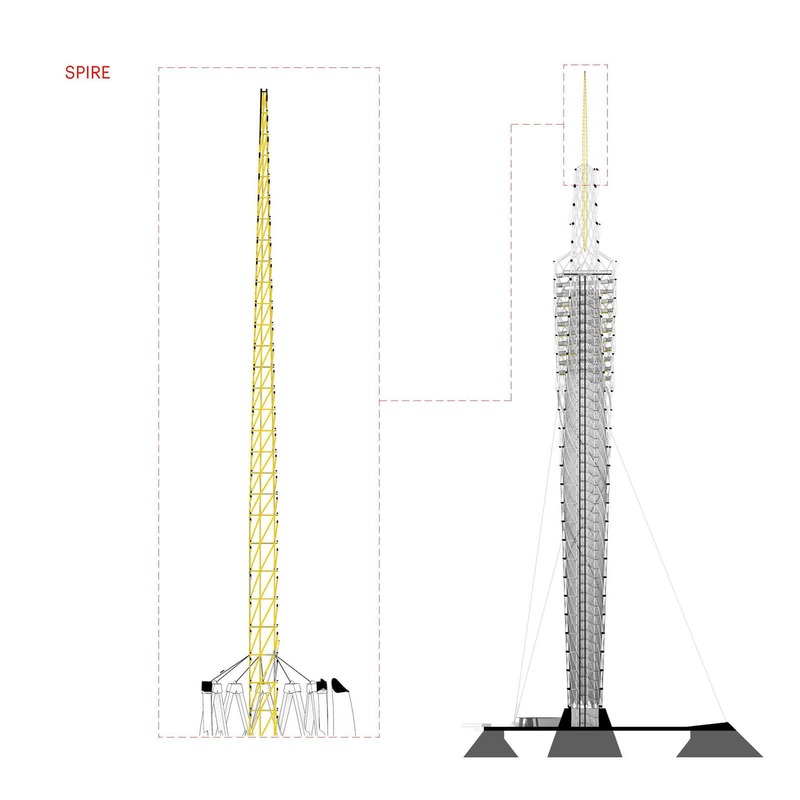 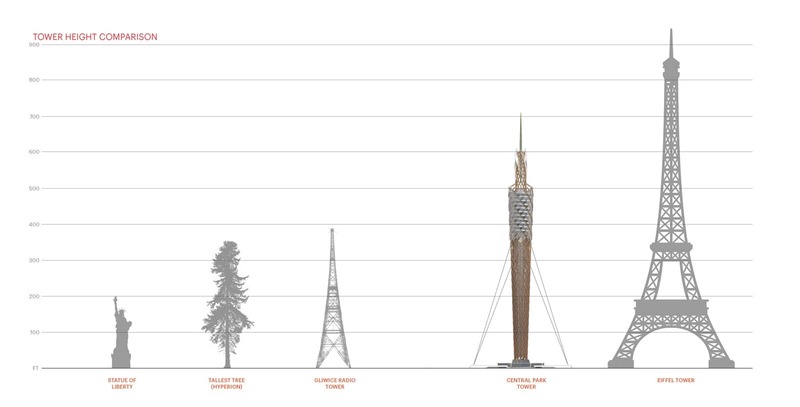 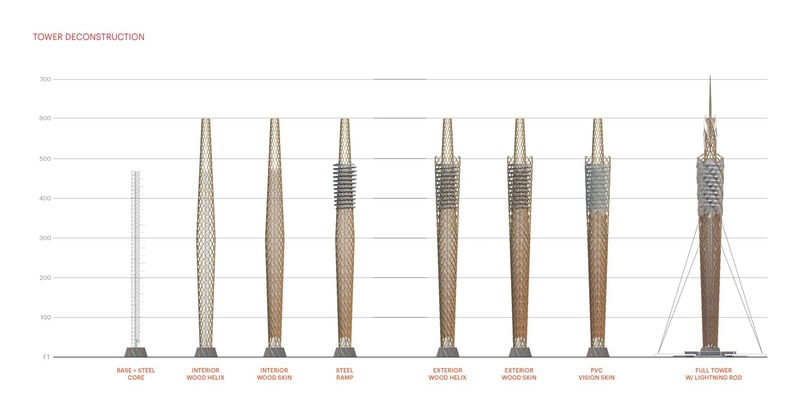 A 112-foot tall lightning rod/spire completes the iconic 712-foot tall structure.